In 2017, the Independent Electoral and Boundaries Commission (IEBC) of Kenya, with the support of the International Foundation for Electoral Systems (IFES) and the United States Agency for International Development (USAID) produced voter education videos, providing information on voter registration. The video is available in English and a transcript of the video is below. Have you registered to vote in the August 8th 2017 general election? 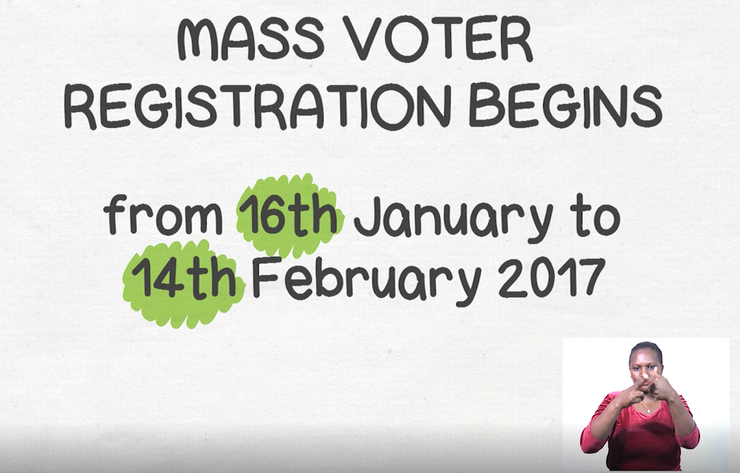 Mass voter registration begins from 16th January to 14th February, 2017 countrwide. To register, you need an original national ID card, or a valid Kenyan passport and physically present yourself at a registration center within your constituency. If you registered between 2012 and 2016, you don’t need to register again! Make your vote count, don’t wait til the last day, register now! IEBC, your vote, your future.